Can we defend inflicting suffering on animals in scientific experiments for human benefit? What limits to gambling can be achieved through legislation? What assumptions underlie drug policy? Can we justify punishing those who engage in actions that harm only themselves? What is so bad about crime? What is the point of punishment? Other chapters discuss health care, disability, safety and the free market. 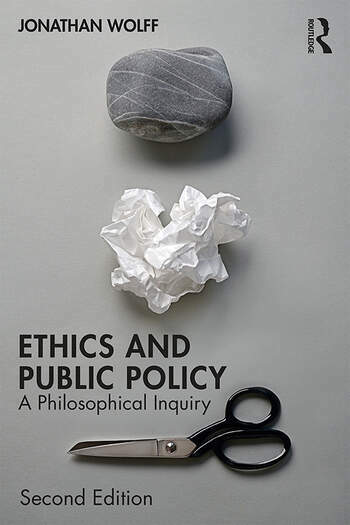 Throughout the book, fundamental questions for both philosopher and policy maker recur: what are the best methods for connecting philosophy and public policy? Should thinking about public policy be guided by an ‘an ideal world’ or the world we live in now? If there are ‘knock down’ arguments in philosophy why are there none in public policy? Revised throughout to reflect changes in policy and research, this second edition includes four new chapters, on risky new technologies, the future of work, poverty, and immigration. Each chapter concludes with ‘Lessons for Philosophy’ making this book not only an ideal introduction for those coming to philosophy, ethics or public policy for the first time, but also a vital resource for anyone grappling with the moral complexity underlying policy debates. Jonathan Wolff is the Blavatnik Chair in Public Policy and Governing Body Fellow at Wolfson College, Oxford, UK. His books include An Introduction to Moral Philosophy (2018), The Human Right to Health (2012), Disadvantage (2007, with Avner de-Shalit), An Introduction to Political Philosophy (third edition 2016), Why Read Marx Today? (2002), and Robert Nozick (1991). He has been a member of the Nuffield Council of Bioethics, the Academy of Medical Science working party on Drug Futures, the Gambling Review Body, the Homicide Review Group, an external member of the Board of Science of the British Medical Association, and a Trustee of GambleAware. He writes a regular column on higher education for the Guardian. Selected by The Philosopher's Magazine as one of 'The best books of 2012'.